Hello everybody. I hope you all had a great week! 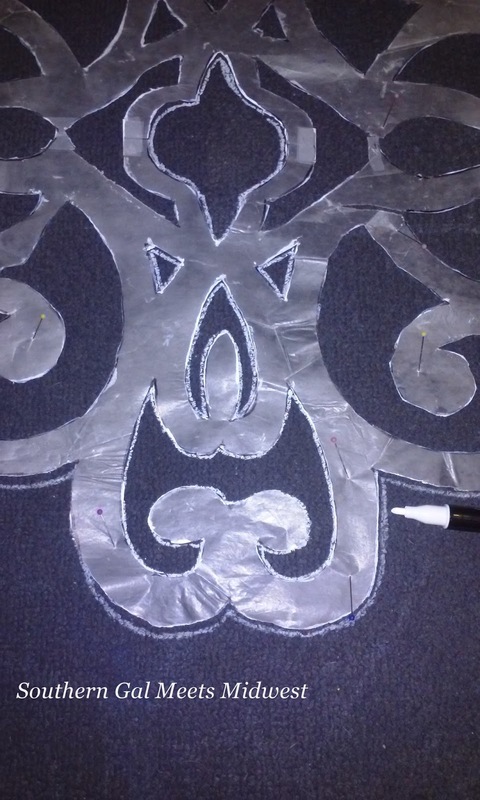 As promised it's time to share some of my sewing/craft room project. I was really unsure where to start with it. Here is the pic I shared recently of the space. 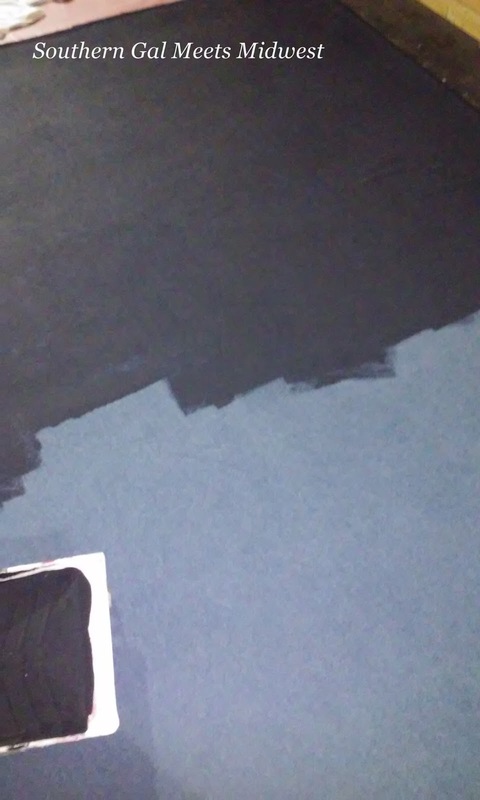 The walls will remain unfinished so they were cleaned and painted with some of the 10 gallons of free paint that I have used for other projects so far. We have paper on the floor so walking over it won't create a huge mess elsewhere. There were old tiles covering all of the living area of the basement and my darling pulled them up to expose the concrete. What he did not know was there was a black adhesive that was used to lay the tiles and it is near impossible to remove, unless you walk across it... then it comes off pretty easily (on your shoes) The decision is to cover it with some moisture resistant tiles we found at the home improvement store. They fit together like puzzle pieces and will serve as a barrier between the nasty black coated concrete and flooring we decide upon later. 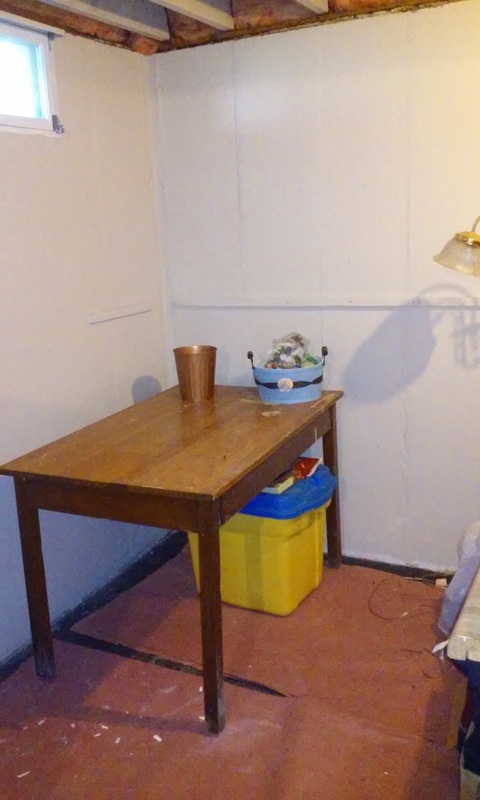 I am a bit impatient as to when that process will get started so something temporary will do to make the space usable. I had been eyeing a rug in our office upstairs (more like wishing it would disappear) it belongs to my darling and finally I was able to convince him it would be best to put this thing out of it's misery. My plan was not to throw it out though. 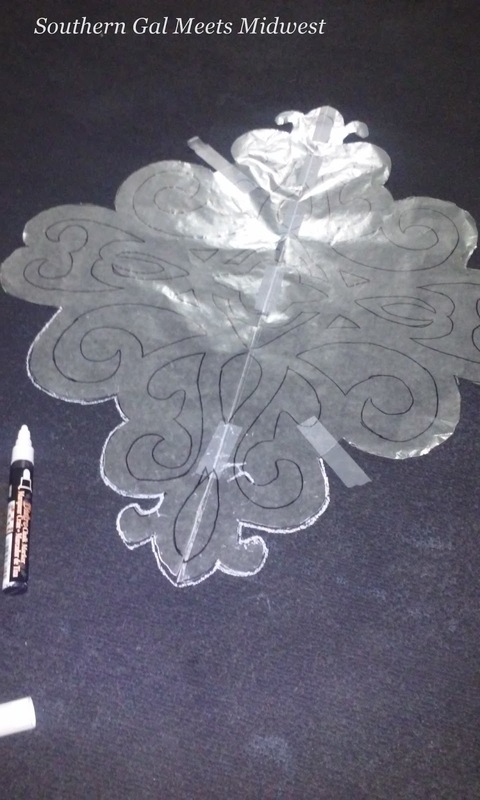 It measures the same size as my craft space (he did not know that yet) and with a little TLC will make a good temporary floor covering. Hmmm...temporary is supposed to be something quick and easy, right? That kinda didn't happen. You see, the rug is old and blue....no need to say anymore. 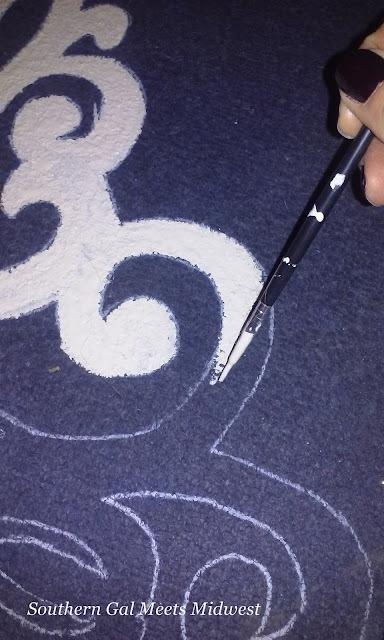 Painting a rug is something I have never tried before and if this does not work I won't be out much except 1/2 gallon of paint. Sherwin Williams - Tricorn Black SW 6258 is my choice for the main body of the rug. 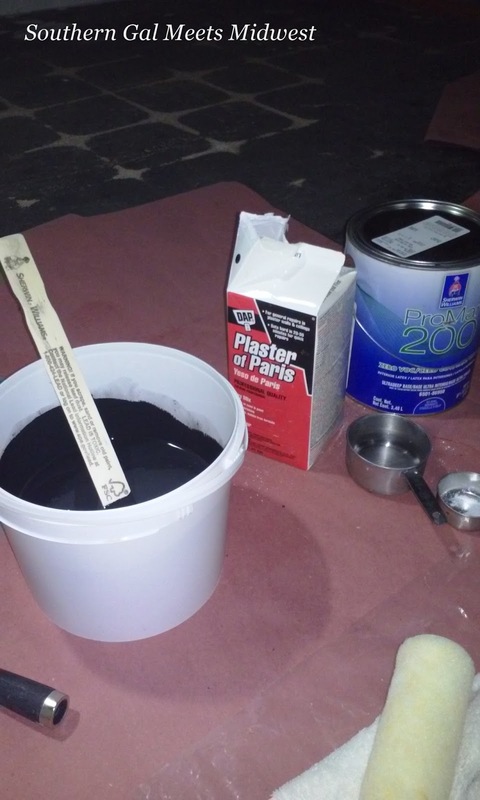 Most tutorials recommend using chalk paint (it makes the surface a little less stiff) so I mixed up 1/2 gallon of paint, 1 cup of water and 1/3 cup of Plaster of Paris. That is my chalk paint recipe. A plastic drop cloth was placed under the rug in case it bleeds through. 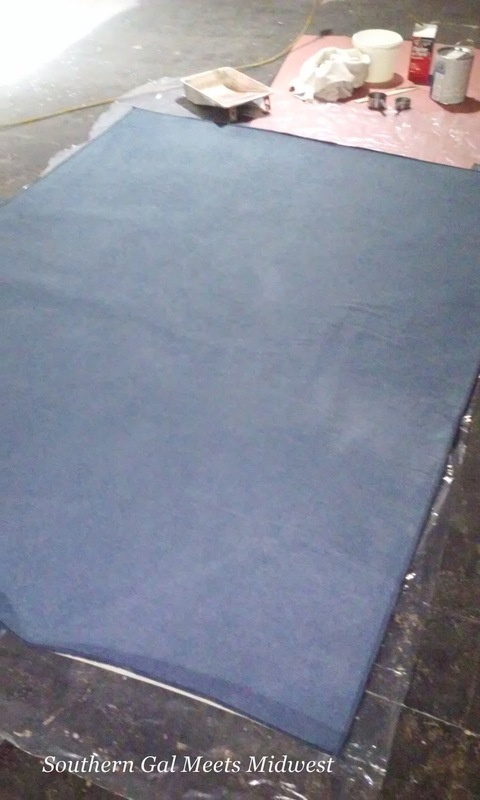 It was checked after 2 days of drying and still felt a little damp so 2 more days were necessary to make sure it was completely dry and ready for the designs. 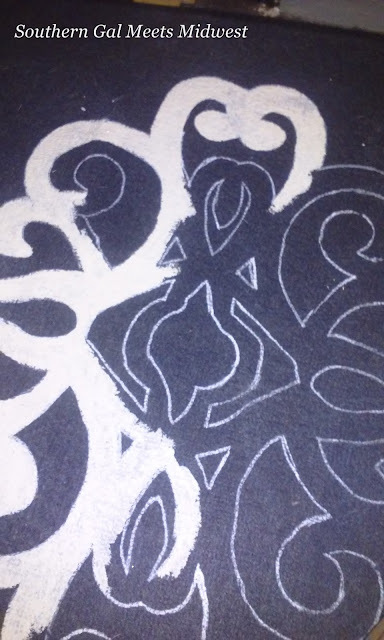 I knew what I wanted the rug to look like but was coming up empty on ideas to make it happen. I kept looking around the house and then there it was, the design on my master bedroom comforter. It would be perfect to create the look I was going for. 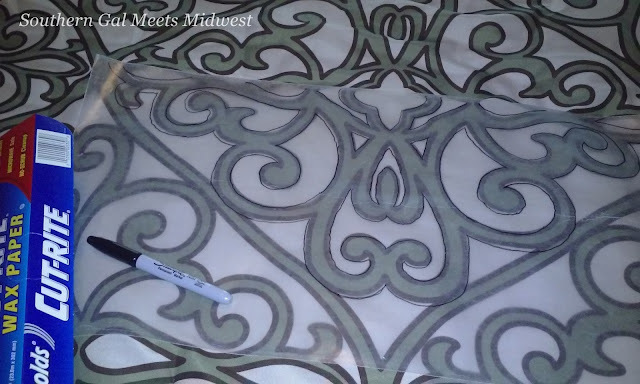 Wax paper would work to lay on top of the comforter since it is transparent and a black sharpie for tracing. Since the wax paper was only 11.9" wide and the design was almost twice that, I had to trace twice and piece together with tape to make one whole template. exacto knife. I placed it back on the rug to trace the interior design and decided to pin it this time cause it was very thin and moved around too easily. And now here comes more of that free paint I got at work. It is neutral and works well for a lot of projects. 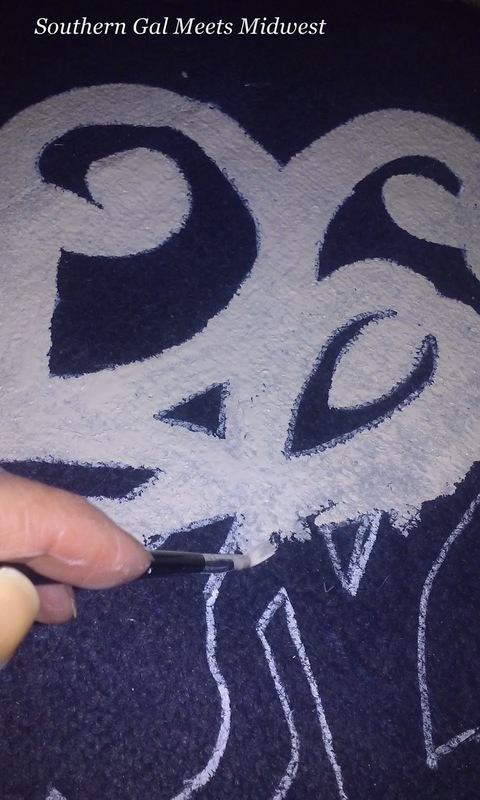 I mixed it up the same way with the chalk recipe and a small brush will be used to hand paint inside the design that was traced. So it was time to start. It took way longer than planned to get these designs done with the holidays in full swing soon after this project was started. My biggest challenge though was staying in the lines and not having drips everywhere. Touch-ups were made with leftover black paint and believe me, there were a lot of touch-ups. 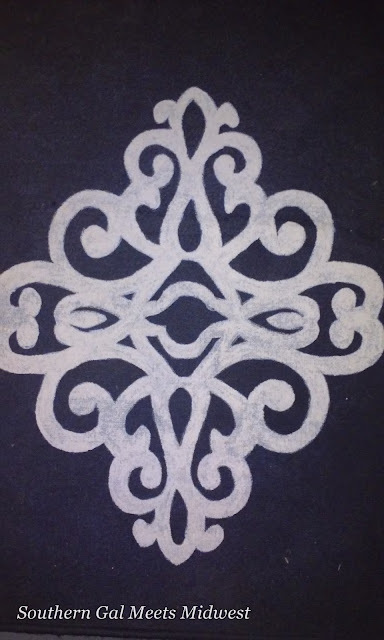 This is one of five designs and I will show the completed rug in a later post. I am very happy with how it turned out and can hardly wait to get it in my little creative space. Hi Karen, what an amazing idea. You are so creative. I can't wait to see the finished product. 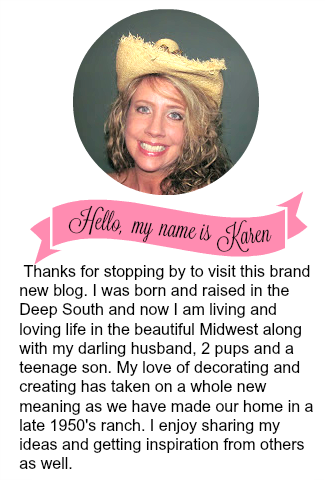 Hi Karen, love your painted rug. The design is perfect. I can relate to the work having painted and stenciled many a rug too. It really is fun and with the right nap of rug can be really the best answer to get just what you want. You are incredibly creative!!!! I can't wait to see the completed rug....and the finished room!! Oh Karen, I admire your patience! This is such a beautiful idea. I can't wait to see the rug in its entirety. The Painted Rug is finished! !